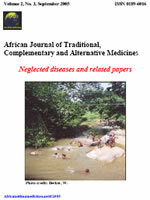 African Traditional Medicines (ATMs) serve as a major source of primary healthcare for African people. The reasons for their use range from easy access, affordability, beliefs in traditional systems and long term safety. ATMs have been used to treat individuals infected with HIV and therefore need scientific validation; a view supported by Traditional Health Practitioners (THPs). This study aimed to evaluate the in vitro cytotoxicity, immune modulatory and anti-HIV activities of traditional multiple herbal preparations from local THPs. Ugambu, Ihashi, Product Nene, Product Blue, SPNa and SDKc ATM were supplied by local THPs. Changes in adenosine triphosphate (ATP) & glutathione (GSH) over 24 hours were measured using luminometry. Changes in 12 cytokines were assayed using an ELISA-based absorbance assay. Protective effects against HIV killing of MT-4 cells were tested using the XTT assay and antiviral activity was measured using an HIV-1 viral load assay. Cyclosporine and AZT were used as positive controls. Ugambu, Ihashi, Product Nene and SDKc induced a dose dependent toxicity on treated PBMCs by reducing ATP and GSH at high doses (p< 0.001). These medicinal preparations, along with SPNa, showed immunomodulatory activity by significantly (p< 0.001) changing the secretion of pro-inflammatory cytokines. Product Blue stimulated the levels of ATP and GSH in treated PBMCs at all doses however this product did not show any immunomodulatory activity on cytokine secretion when compared to control cells. Ugambu, Ihashi, Product Nene showed promising anti-HIV activity relative to AZT (p< 0.01). This study has shown that some of these traditional medicinal preparations have at least one or all the properties of immunostimulation, immunomodulation or antiretroviral effects. The mechanism of action of the shown activities should further be investigated.